In the old days, a person stood at the front of the room and gave a lecture. Some stuff sank in, but not much. Then everybody went back to their work uncertain about what actually was retained. It was (and still is) expensive. But today, we are witnessing a social transformation that’s revolutionizing education. Where does your enterprise sit on the new corporate learning curve? With the internet came the promise of learning online, and E-learning came into fashion. The most logical format was to package information into lessons or modules that people could study on their PC rather than in a classroom. E-learning provided some big advantages. It made training highly scalable, and you could take the course at any time. However, there was little change from the classroom-style training where someone told you what was important to learn. Later, when Learning Management Systems (LMS) progressed from a “Register and Launch a Course” device to include social features such as ratings and comments, corporate learning began to truly evolve since it gave the learner a voice. This democratization of learning was a result of social applications conquering the consumer space and the corporate learning world’s attempt to consumerize applications within an enterprise. So a shift in corporate learning took place by empowering employees to decide what they want to learn and to learn from each other (peer-to-peer learning). Thought leaders claim that social learning will significantly shape the future of corporate learning. So what is social learning? Observational or social learning occurs when individuals watch and then imitate others. In broader terms, we speak about social learning when people learn from each other in an informal way or on the job, as opposed to a formal training course. Social learning has been taking place since the beginning of mankind. In the corporate environment, social learning was limited because there are only a small number colleagues that you can learn from directly. However, with social technologies, even large organizations can effectively use social learning across departments and even across continents. When social platforms, like Facebook, became popular, smart corporate educators started to take notice. They understood that people like to go to social places, like YouTube, to learn. They also explore avenues such as blogging, which provides for a good measure of give-and-take. This process has quickly evolved into what more innovative organizations are implementing to optimize corporate learning at all levels. At the same time, company leaders and learning leaders are struggling to redesign their learning approach and strategy. For one, they are confronted with an incredible array of new learning technologies. Which tools are the most effective, what are the pros and cons of each? Some companies spend tens of millions of dollars through trial and error to figure out the best approach. Initially, Facebook style applications were introduced into corporations. Those applications were designed to build a social network, or a network of people with the desired outcome that by connecting people, people will also learn from each other. Unfortunately, many companies are struggling to gain adoption among their employees, but that’s only because they misidentify core motivating factors. 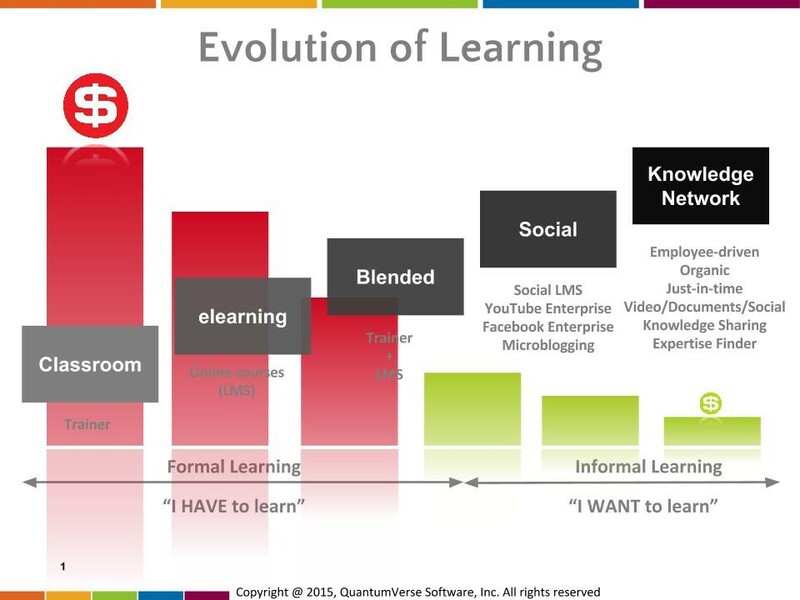 Now there’s a new generation of social learning applications called knowledge networks. The key difference from social networks is that knowledge networks focus on building a network of pieces of content (knowledge) as opposed to building a network of people. They take into account that employees are primarily interested in the subject itself and secondarily the contributor’s identity. In both social network and knowledge network applications, content is mostly originated by employees. Here we encounter a paradigm shift in learning as it has become both democratized and personalized. For example, how many times have you typed into a search bar, “How to…”? If you transfer this concept to the corporate level, the collective intelligence of the hive provides answers that work. Technology facilitates this process since everyone can learn what they need to learn when they need to learn it. Instead of getting lectured, knowledge is there for those who want to learn. Participants seek the information because it’s useful to them. People are happy to learn what helps them get their job done faster and easier. The beauty of this new paradigm is that costs actually plummet when a knowledge network is put into place. 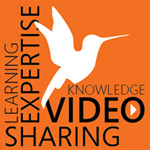 Although it’s collective, the knowledge network fully emphasizes and celebrates the individual. Everyone has a voice, and everyone has access to the same information at all times. There are no learning barriers, and all members make a contribution to the knowledge base. Info doesn’t come from someone isolated in an ivory tower. Instead it comes from the masses, and if it’s truly valuable it gets noticed and used. Marketers know that consumers want to discover. They want things their way. The same ideology can be applied to the corporation when it wants to teach. In a nutshell, all the managers have to do is keep the lights on and let the team create, share, rate, and promote what’s good for business. This real world knowledge is what every worker craves and what every manager should provide. Mobile – The ability to share and learn on-the-go is vital. If your knowledge network isn’t mobile friendly, it’s irrelevant. Social – Your platform must provide every user with a chance to access and contribute to the knowledge base in a meaningful way. Let them connect with each other. Avoid Knowledge Silos – Employees must be able to interact across team and geographical boundaries. Cross knowledge sharing eliminates resource waste. Just In Time – You want your platform to be nimble enough to provide exactly what a person needs to learn at the touch of a button. When a person finds just the right slide show or video, they pay attention and deepen their knowledge. Scalability – Your knowledge network should be fully capable of handling a few or thousands of participants. Ease of Use – The platform should make information easy to upload, share, search, and rate. Remember, this new form of learning and teaching requires a bit of trust. If you are used to a rigid hierarchical approval process, then you’ll miss out on the richness and efficiency that knowledge networks provide. This doesn’t mean that you have to sit on the sidelines. On the contrary, it’s much better if you get involved in the mix with the rest of the team. You might even learn a thing or two. Have I managed to capture the key trends? Share with us your thoughts on how you see the future of corporate learning unfold!